Mosaic of southern hemisphere of Miranda, the innermost regular satellite of Uranus, with radius of 236 km. Projection is orthographic, centered on the south pole. 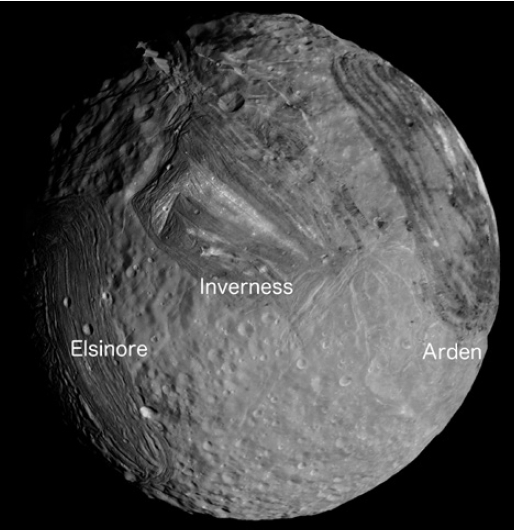 Visible from left to right are Elsinore, Inverness, and Arden coronae. Image credit: NASA/Jet Propulsion Laboratory/Ted Stryk. Boulder, Colo., USA – Miranda, a small, icy moon of Uranus, is one of the most visually striking and enigmatic bodies in the solar system. Despite its relatively small size, Miranda appears to have experienced an episode of intense resurfacing that resulted in the formation of at least three remarkable and unique surface features -- polygonal-shaped regions called coronae. These coronae are visible in Miranda’s southern hemisphere, and each one is at least 200 km across. Arden corona, the largest, has ridges and troughs with up to 2 km of relief. Elsinore corona has an outer belt that is approx. 80 km wide, relatively smooth, and elevated above the surrounding terrain by approx. 100 m. Inverness corona has a trapezoidal shape with a large, bright chevron at its center. The northern hemisphere of Miranda was never imaged by the Voyager 2 spacecraft, so it is unknown whether additional coronae exist. Using numerical models, Noah Hammond and Amy Barr show that convection in Miranda's ice mantle likely formed the coronae. During convection, warm buoyant ice rose toward the surface, driving concentric surface extension beneath the locations of the coronae, causing the formation of extensional tectonic faults. This style of resurfacing is similar to plate tectonics on Earth, in that convection is a primary driving force for surface deformation. Hammond and Barr write that the internal energy that powered convection probably came from tidal heating. Tidal heating would have occurred when Miranda was in an eccentric orbit -- moving closer to and further from Uranus. This caused the tidal forces from Uranus to vary, periodically stretching and squeezing Miranda and generating heat in its ice shell. Hammond and Barr find that convection powered by tidal heating explains the locations of the coronae, the deformation patterns within the coronae, and the estimated heat flow during corona formation. Miranda, an icy moon of Uranus, is one of the most visually striking and enigmatic bodies in the solar system. Three polygonal-shaped regions of intense deformation, dubbed "coronae," dominate the surface of Miranda. Here we use numerical methods to show that sluggish-lid convection in Miranda's ice shell, powered by tidal heating, can simultaneously match the global distribution of coronae, the concentric deformation pattern, and the estimated heat flow during formation. The expected rheological conditions in Miranda's ice shell lead to the development of low-order convection that produces surface deformation patterns similar to those observed. We find that satellite core size strongly controls convection geometry and that low-order convection patterns are much more stable for core radii less than half the satellite radius.